Kapao Dos, a café in Egmore that’s popular for its 6 kinds of momos and fries and Vietnamese coffee has a lot more to offer. We dropped by to check out their new menu (that includes more mains and desserts) and we weren’t disappointed! Kapao Dos is situated inside Wellingdon Estate complex in Egmore and the café is pretty small. In terms of ambience, it’s super simple with pop culture posters framed on its walls. But hey, the food here is big on flavours. We started off with the Home Made Chicken Nuggets ( you can’t just have one, peeps). The Mac and Chicken was amazing; you get four pieces for INR 150, and they’re creamy and meaty and just delicious. They also have flavours like Butter Chicken and Bong Bomb that has a nice kick of Kasundi. Starting at INR 100 you can dig into their varieties of momos from cheesy to fried and their range of fries too start at INR 110. The Pizza fries with margarita sauce and oregano sounded interesting but we decided to go with the vada pav with a twist. The Italian Meatball is a saucy and meaty slider we liked; you can also choose to go with mushroom melt, cheesy vada to name a few veggie options. We love the local vathal – crispy rice papads – that they come with! 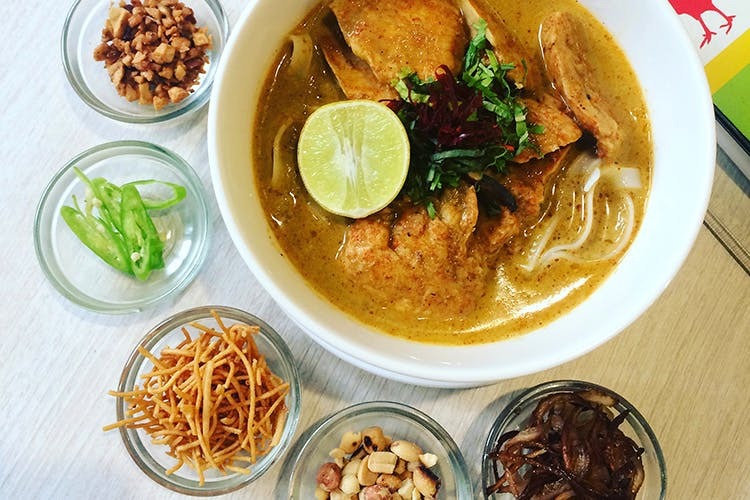 For mains they have dishes like the soul-warming Burmese Khao Suey, Korean Fire Chicken (traditional cheese buldak, a spicy chicken dish) served with rice and pickled cucumber, and Palestinian Chicken Platter with homemade pita and tzatziki. They even offer 5 kinds of pasta dishes. So expect a range of dishes across cuisines. If you’re in the mood to experiment, wash down your meal with their Paan Mojito or like us get addicted to their Vietnamese Coffee. We wanted at least 5 cups! The only problem was that the cup size was a bit too small to satiate our cravings. Craving something sweet? They even have a dessert section called Crumb Patisserie that serves a 24 layered cake (OMG) and even an Old Monk-infused sponge cake with raspberry compote and chocolate ganache. Read more about it here. We really did enjoy our meal here at Kapao Dos. Not only did we gorge on the meals oh-so happily, we spent hours talking with the charming owners, Ankita and Rohan, experienced chefs who put a lot of heart and soul into their food. And we think it definitely shows.